This weekend was entirely devoted to the garden. We created two new beds and have the supplies for a third and fourth. I am not sure what happened, but I seemed to have had picked up the wrong size wood because what I had planned came out larger! I think I may have gone brain-dead while at the lumber yard. I don’t know. 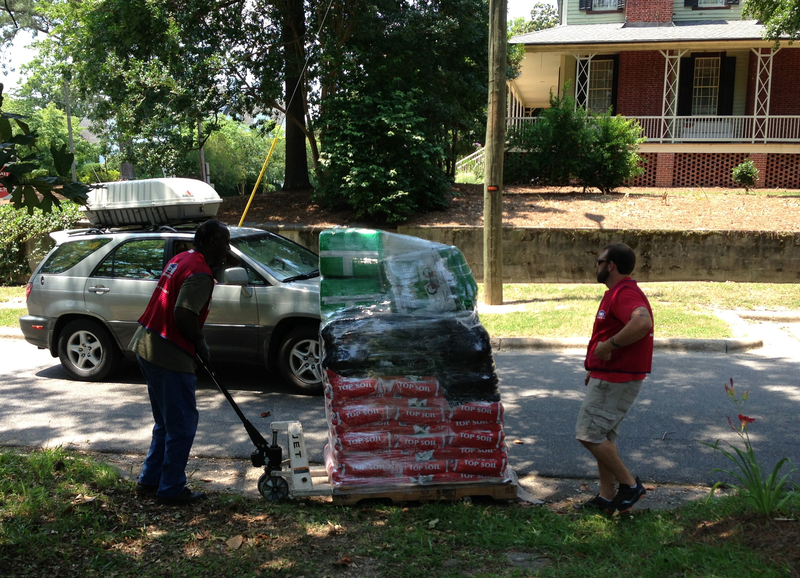 Anyhow, we ended up having to order two pallets of soil and four bags of peat moss to get the job done. Yikes, more money than anticipated! Landscaping cloth on bed one. 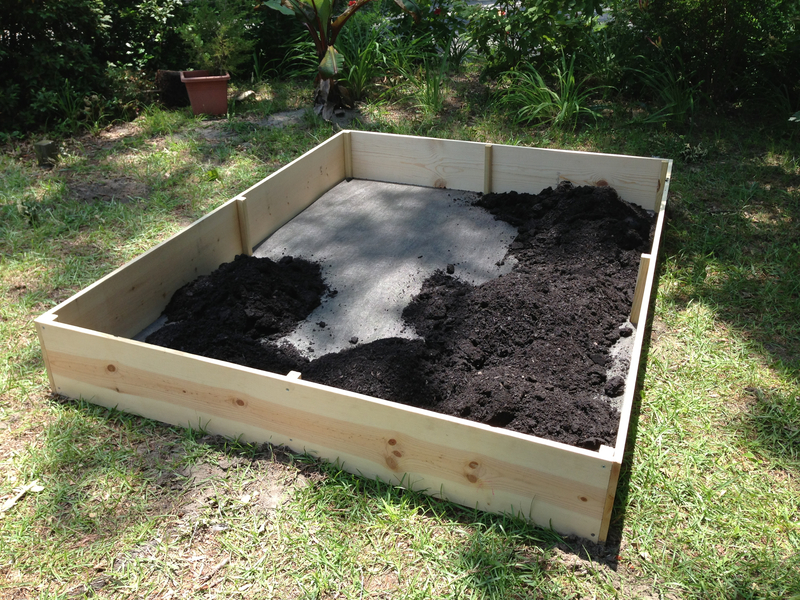 Landscaping cloth on bed two. I have the construction down so it didn’t take too long to build. The only thing I did different from the original three is use landscaping cloth, which I should have done on the originals because I have some crazy roots growing up into two of the beds. The dimensions of the two new beds is 8′ x 6′ and the other is 8′ x 4′. When my roommate and I went to get soil we realised we would need to haul a lot. 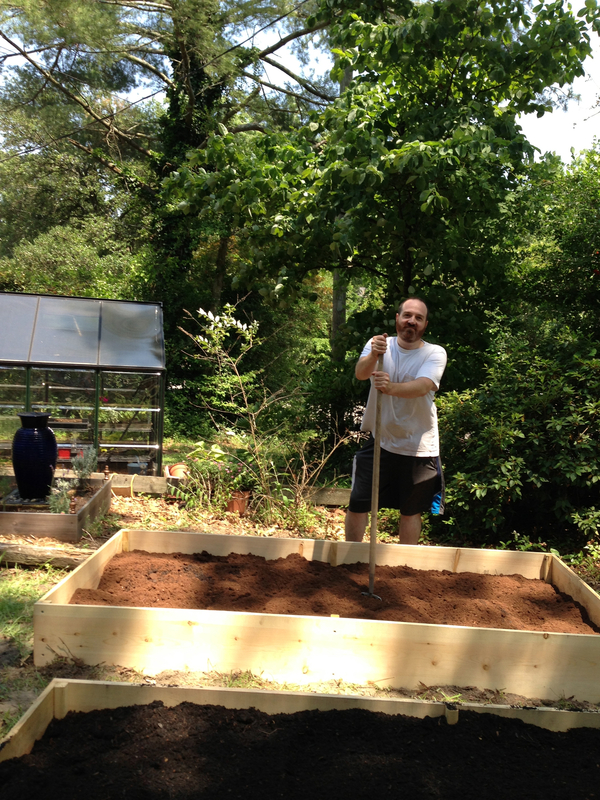 We also figured in two more beds that have yet to be completed so we ended up having it delivered. In retrospect this was probably the wrong thing to do. There was a $79 delivery fee! Suffice to say we won’t be doing that again. 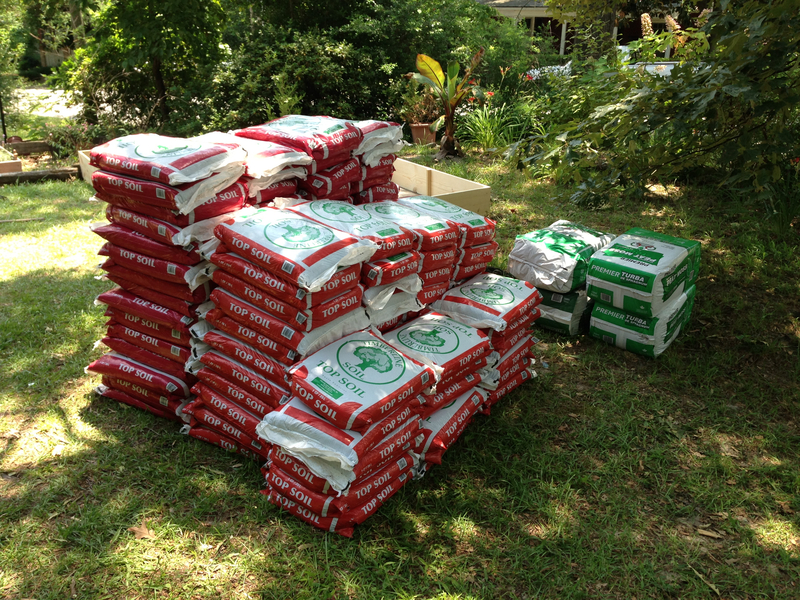 However, I am not so sure we will need anymore soil than what we have because we had 120 bags of topsoil and 4 bags of peat moss delivered! We decided to purchase some plants in advance since we have nothing growing in the greenhouse from bulbs. 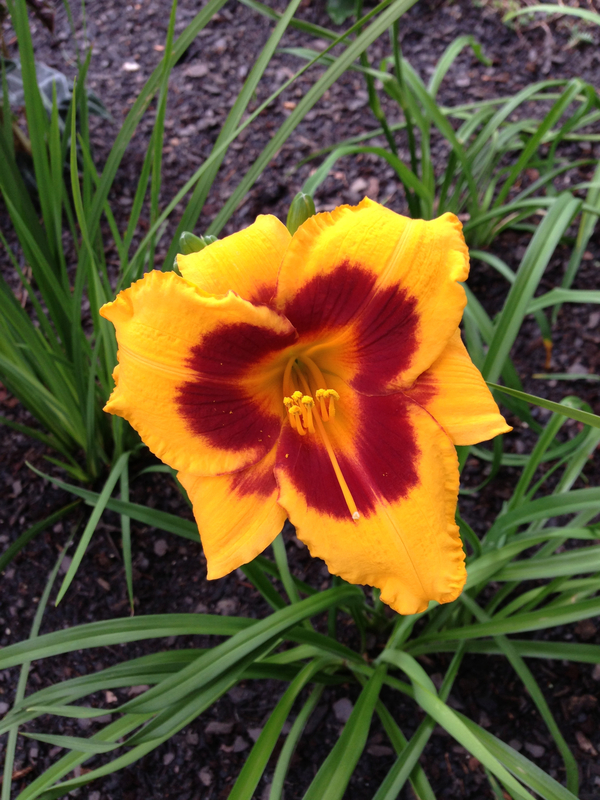 I also dug up some randomly planted lilies from around the property to fill the beds. This autumn I intend to dig up all the lilies from the older raised beds as well as the other plants and transplant them to the new beds. I would like to replace most of the soil in the original beds with better soil and try growing vegetables again in those beds. These two beds are ornamental and receives dappled lighting, which is great for shade loving plants and partial sun plants. The rear bed currently has extra herbs we received as a gift from Melissa’s sister-in-law. 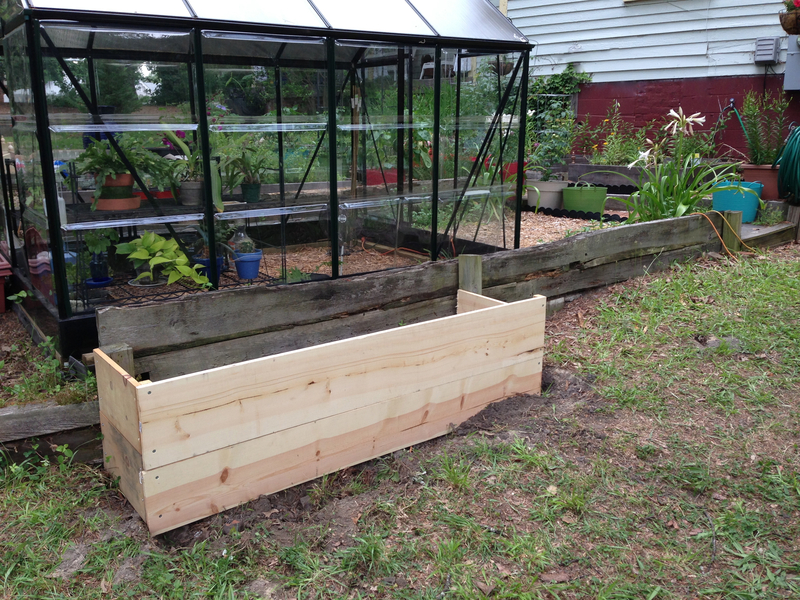 I intend on building a 6′ x 4′ bed next to the rear bed (to the left in this picture) and will transplant the herbs to this bed. It is close to the older herb bed and makes sense. This will free up more space for more ornamental plants. 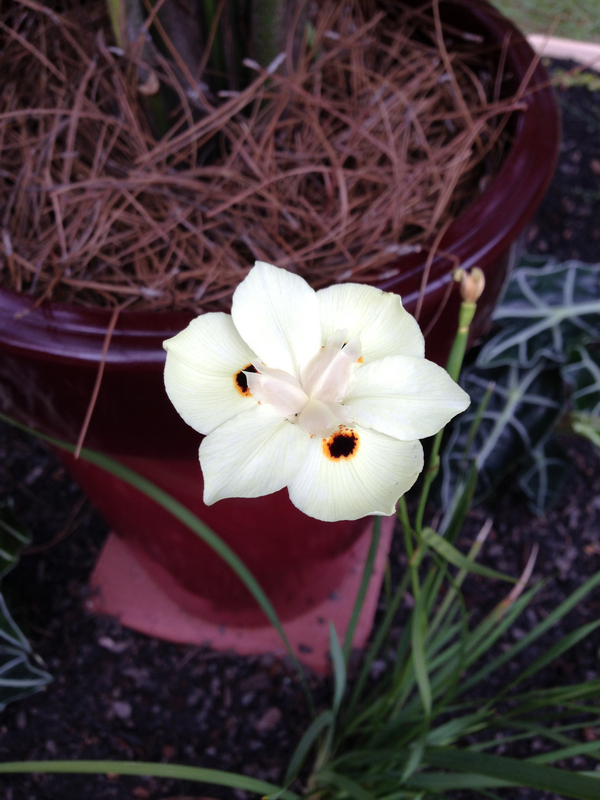 Speaking of, I had two flowers pop out last night in the new bed! 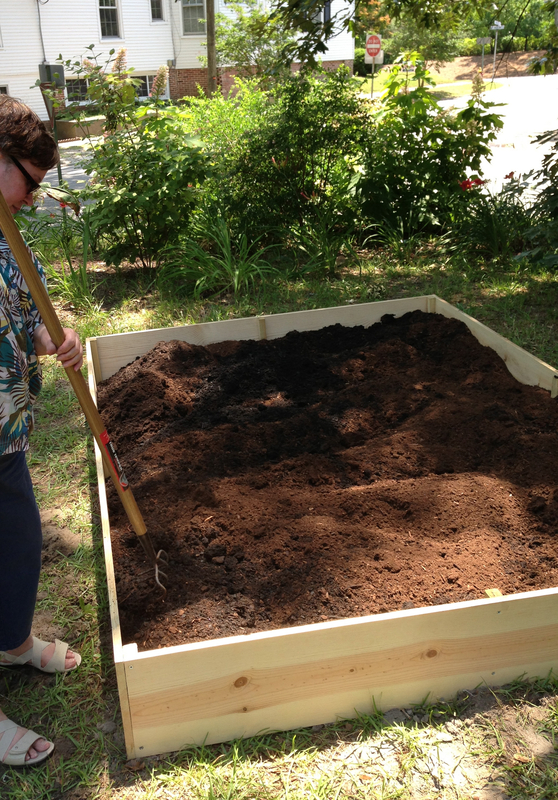 I took a day off from work today so I could continue working on the beds, but I barely had any energy to do much. 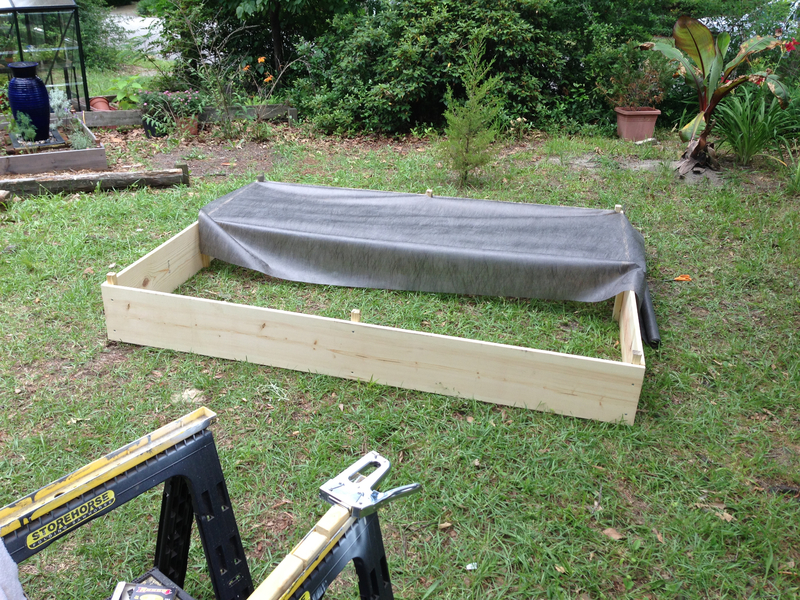 I did manage to get to the lumber yard for two pieces of wood for one of the beds, but when I began work on the “fern bed” it became clear it was going to take some time to build. The ground I am building on has a crazy angle and I came across a rather large root from a tree. 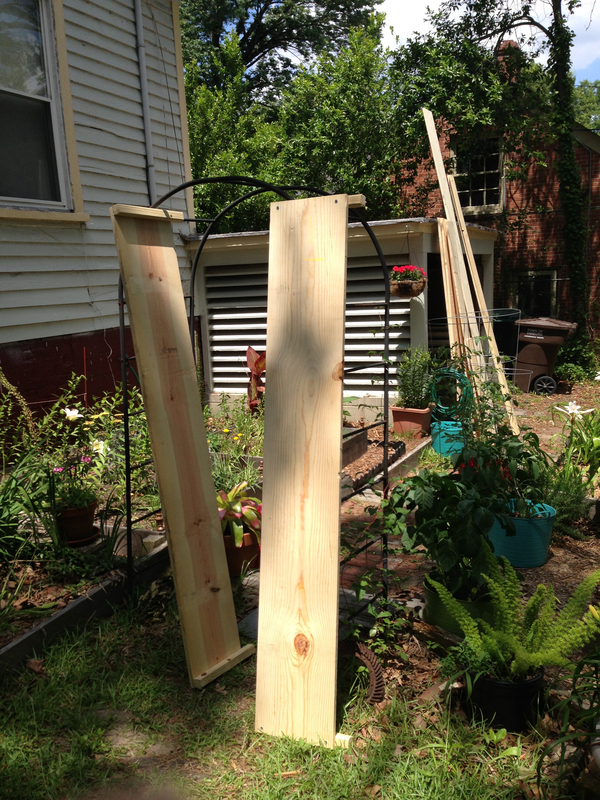 This made it so I could not use both 12″ wide boards. 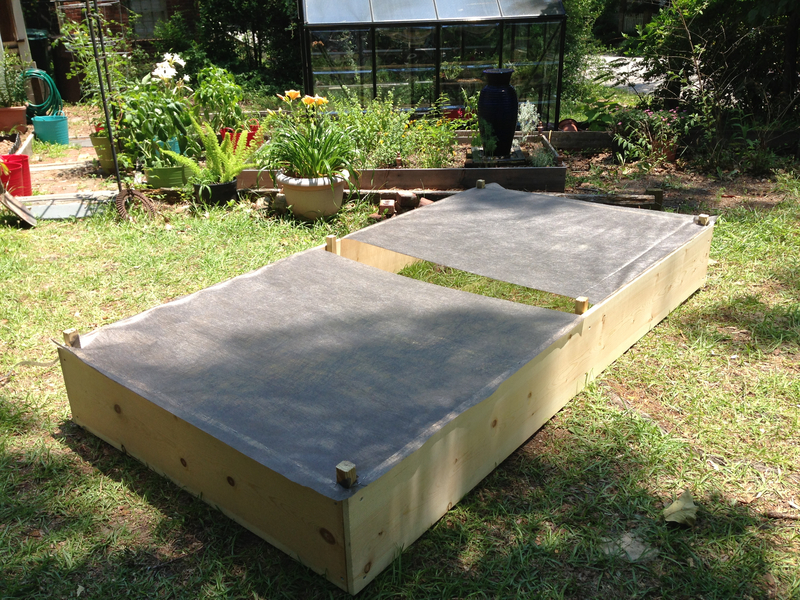 I had to use one of the 10″ wide boards that was supposed to be for the smaller bed on the other side of the greenhouse. After I got part of the bed constructed it started to rain. So that was that. 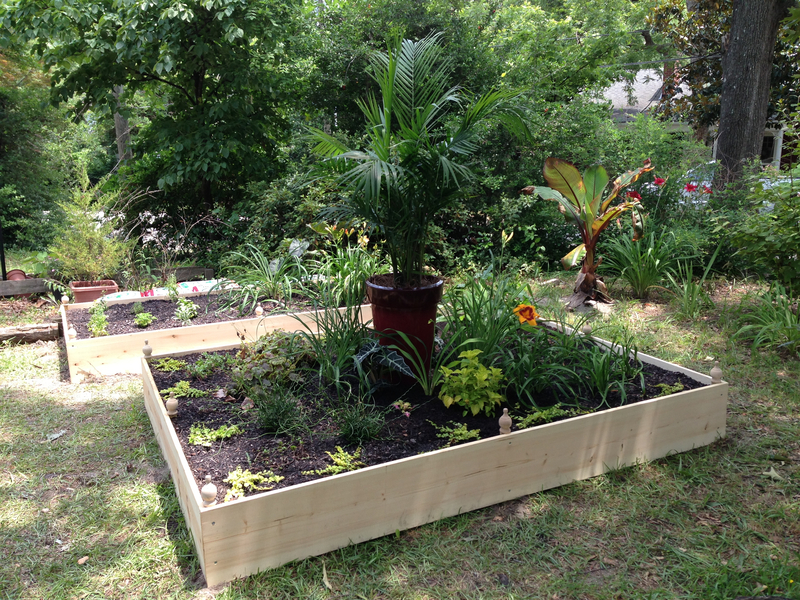 Not only did I not finish the fern bed, but I used the wood intended for the other bed so I couldn’t work on it either! The beginnings of the Fern Bed. The bed will continue the length of the retaining wall (towards the right of the picture). I call it the Fern Bed, but it’s going to have more than that in it. The part that is constructed already will contain most of the ferns. It’s a dappled light area and the ferns will love it and it will soften the hard angles and unattractiveness of the retaining wall. As you move to the right the area receives more light. I am considering of moving the lily trees to this location since they haven’t become anything like trees as of yet. This was my weekend + one! I hope everyone had a wonderful weekend too.